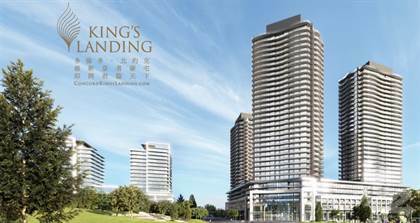 King's Landing Condos is located at Esther Shiner Blvd, North York. It is located at Leslie. / Sheppard Ave E developed by Concord Adex starting at $400,000. The estimated occupancy at summer 2022. This new project is a new condo development coming to one of the most exciting master-planned communities in Toronto. This is your opportunity to own in the fabulous Concord Park Place. King's Landing Condos will be part of Concord Park Place. It is located directly across from Bessarion Station on Line 4 Sheppard on Esther Shiner Blvd in North York. For more details, Please contact Ken Yeung at 416-618-9890. Hi, I'd like to find out more information about King's Landing. Thanks so much!